Zidane is the protagonist of Final Fantasy IX and acts as the player character for the majority of the game. He is rash, upbeat, witty, often sarcastic, and extremely charismatic. He is a shameless flirt by nature, as most women in the game will note, most notably Princess Garnet. While he often acts immaturely, which infuriates party members like Steiner and Amarant, he is fiercely loyal to his entire group and often acts as a mentor to some of his less-experienced friends, such as Vivi, Eiko, or even Garnet. Zidane is in the employ of Lindblum's Theater Troupe, Tantalus, at the beginning of the adventure, traveling with the crew to make a performance in Alexandria. The original goal of the troupe's visit to Alexandria is actually to abduct Garnet, but it is soon revealed that the kidnapping is benevolent in nature and is an attempt to bring her safely away from her mother, Queen Brahne. Zidane's adventure truly begins following the mission in Alexandria when he leaves Tantalus to help bring Garnet to safety. Zidane is a physical character by nature and his role acts as a thief for the party. He fights with daggers and thief swords while wearing light armor and headgear. He is one of the strongest physical attackers in the game. His skills are more utility-based than damage-dealing, though he does have some damaging abilities as well. Zidane has two unique commands in battle: Steal and Skill. Steal allows him to attempt to take an item away from an enemy in battle. Skill allows for a variety of effects to happen, including an automatic escape from battle, placing status effects on enemies, and dealing damage based on his current HP or based on how many times he has successfully stolen items throughout the course of the game. 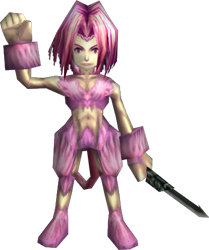 When Zidane enters Trance, his clothes disappear and he is covered in glowing pink monkey-like fur. His attack damage increases and his Skill command is replaced by Dyne. Each Skill that Zidane has learned unlocks a new command in the Dyne menu. Dyne commands are specifically damage-dealing attacks, with each additional Dyne command representing either an increase in power or a change between single-target and multi-target. Zidane's Dyne command is one of the earliest methods in which a party member can deal maximum damage in a single turn.